It’s 10 p.m. Tuesday night in Jeonju, South Korea, so my peeps in Florida probably just started Tuesday morning (I think it is 9 a.m. Florida time, but honestly I’m still a little foggy on the time change thing. Am I living in the future?!). I just finished meeting with my group — tomorrow we have to present/demonstrate a lesson plan in front of a few staffers and our entire class (about 60 people). I hate presentations so I’m nervous, but I think our lesson plan is pretty good. It’s on “ordering in a fast food restaurant,” which I think will go over well in a room full of expats who have been eating rice and kimchi for a week. This week has been really crazy. 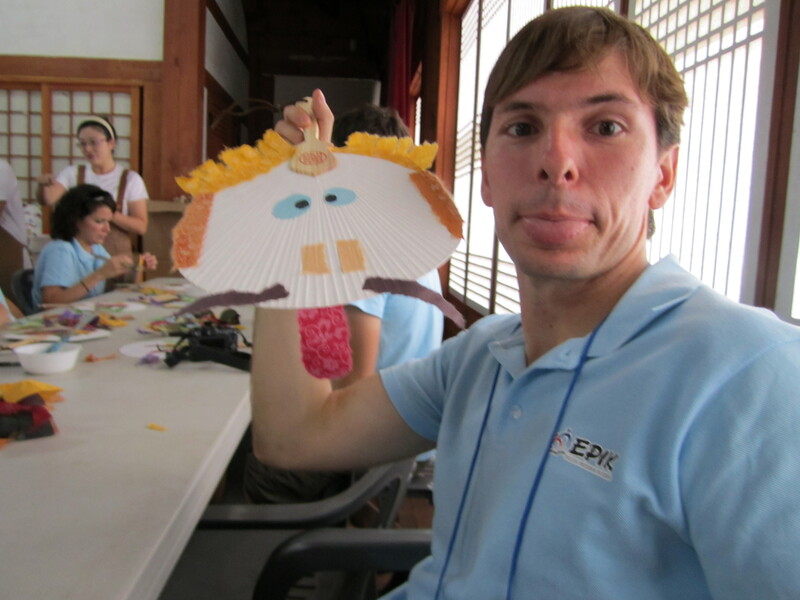 Every day we have six full hours of lectures, followed by an hour of Korean Language class. Sunday we went on a field trip, so even though our brain got a break we were totally exhausted. We skipped dinner and Alex fell asleep at 6 p.m. and slept for nearly 13 hours! It was an amazing trip though. 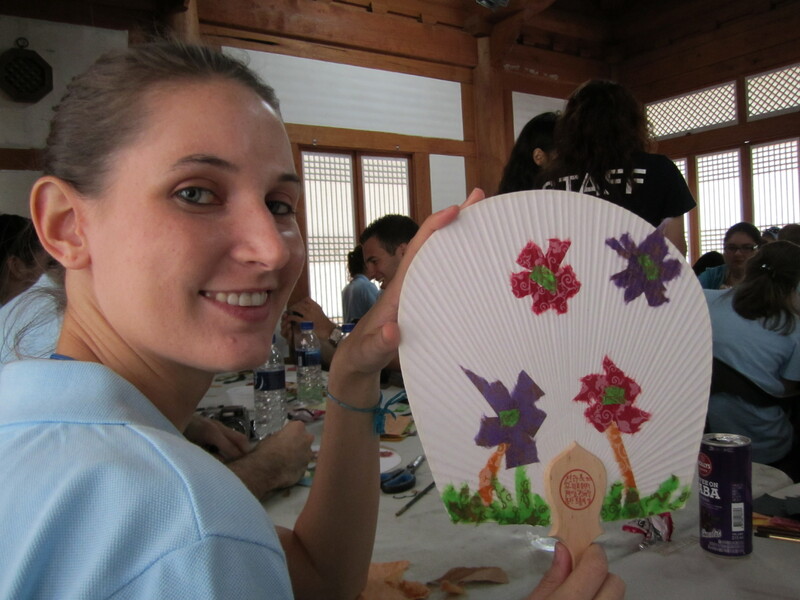 We went to a Jeonju Hanok Village, where there are Korean traditional houses, a rice wine museum, an Eastern medicine museum, a Hanji center where they make traditional Korean paper, and a fan-making shop. We got to decorate our own fans! Then we had the meal that JeonJu is famous for : bibimbap. It’s rice with all sort of veggies and spices mixed in, and a fried egg on top. You mix it all together, and it is delicious! Koreans eat family style. I have never seen anything like it: all the food is in the middle of the table and everyone just digs right in. It’s a little weird for us, but very fun, too. I’ve been trying all sorts of new food and I like almost all of it so far. Maybe the most odd was strips of dried fish dipped in a sweet, sticky brown sauce. It really didn’t taste like fish until you chew it for a while, but it was good. 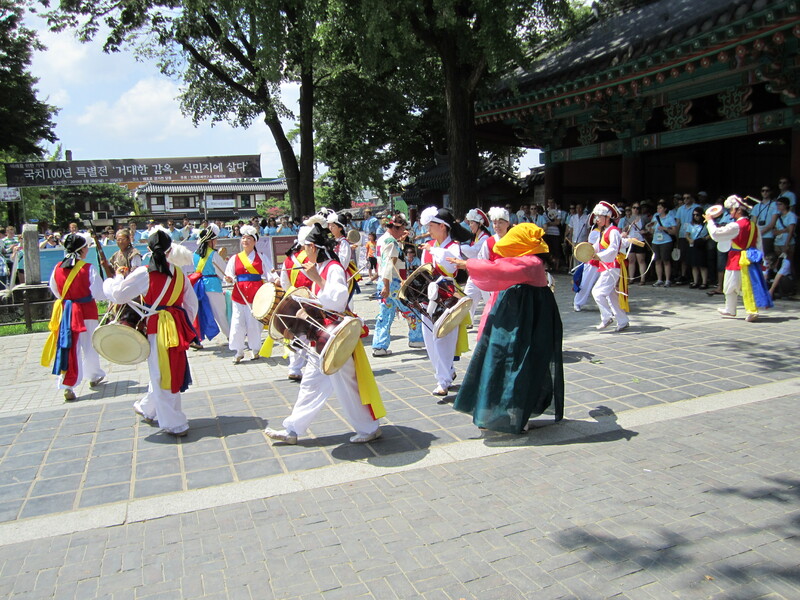 After our lunch we saw Samul Nori (Four Drum) dance, which is pretty neat — and at the end of it, they invite everyone in the crowd to dance with them, so all the teachers joined them in the middle of the town square. This little old lady (they’re called “ajummas”) was trying to teach me how to dance; it was really cute. 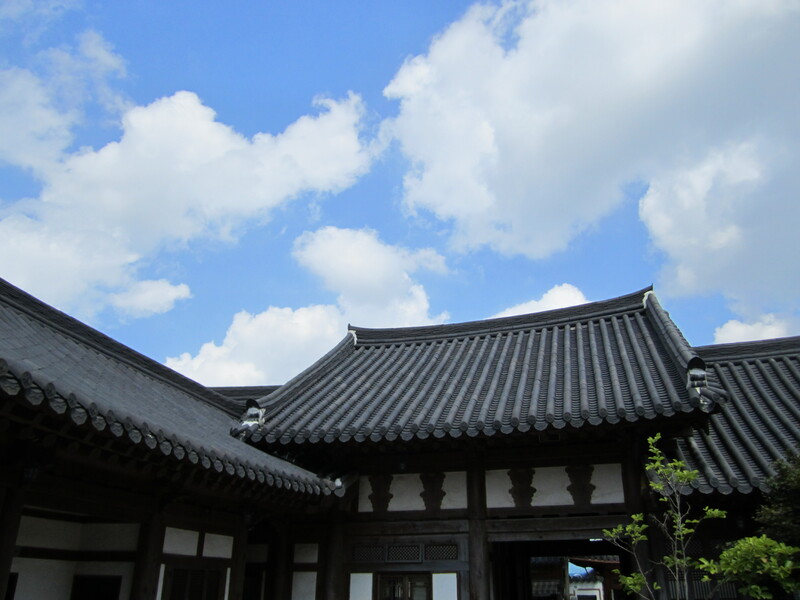 Afterward, we went to Keumsan Buddhist temple, which was a sight to behold. The walk up is through a mountain, complete with a peaceful and very cold) stream. 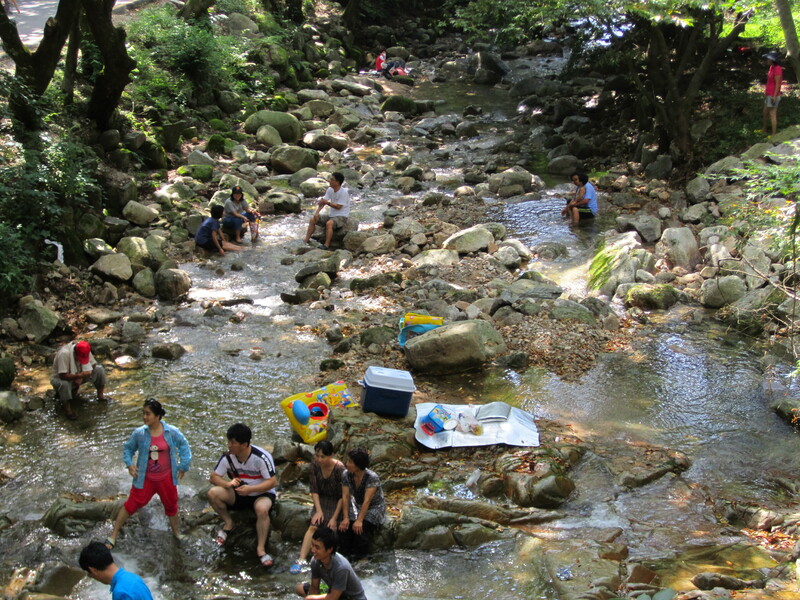 There were families camping all around and even in the stream at the shallow parts, and everyone is cooking barbecue on tiny grills and playing card games. It was a happy moment. 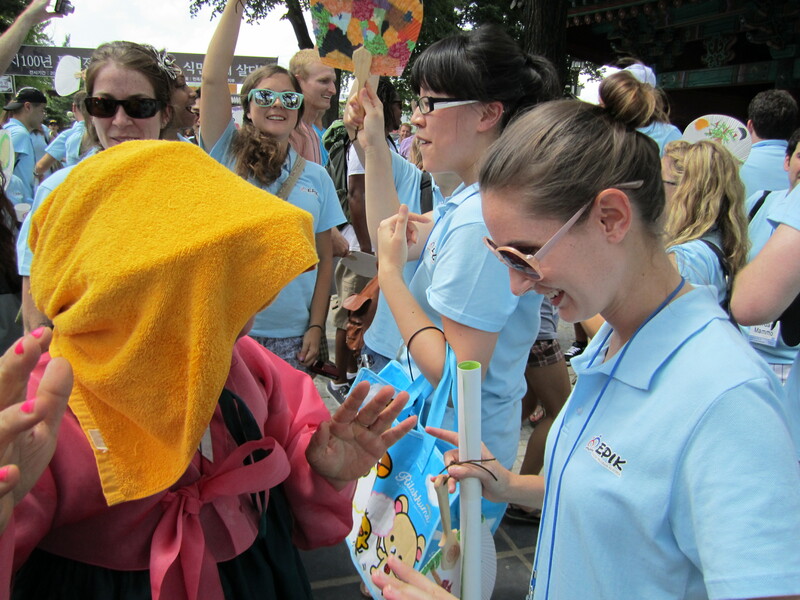 Lots of people approached us to practice their English, and some people in our group were even invited for drinks and barbecue! 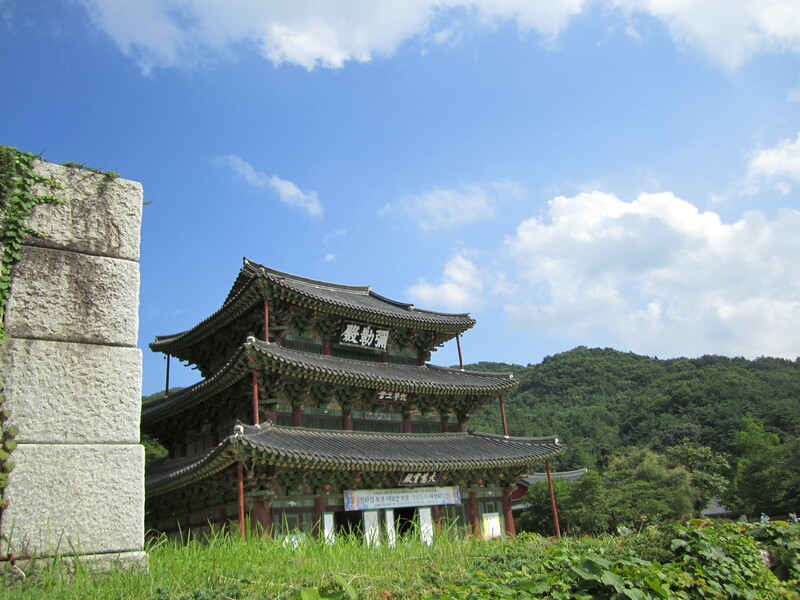 The temple itself was beautiful and peaceful, set back in the middle of the mountains. Since then it’s been anything but peaceful: nothing but lessons and prepping for our presentations tomorrow. After that, we’re meeting our Metropolitan Office of Education supervisors (I guess the equivalent of a superintendent) to sign our contracts. And then we find out what grade we’re teaching and what school we’re in! I can’t wait. After that, it’s the farewell dinner and the next morning, off to Daegu. We don’t really know how things go from there — or even when our first day of school is — but we’ll be meeting our co-teachers. They’re basically our lifeline in Korea. They help us get our Alien Registration Cards, get cell phones, set up Internet and show us around the city. Then, we see our apartments, so it’ll be a big day. I am really hoping we have the weekend off before we have to start teaching, but we may have to go in on Friday. I’m getting nervous! You can’t cram an Education degree into 10 days, but our lectures have been really useful and I feel a lot better prepared for teaching. Pack dozens of teachers into dorms, lecture at them for 10 days straight while feeding them quasi-Korean food and then smoosh them against a wall and some desks and tell them to pose while saying "Kimchi!" and this is the photo that you'll get.